Mike Woods, the second Canadian to win a Spanish Vuelta stage earlier this month, became the country's first cyclist to reach the podium at the road race world championships in 34 years with a third-place finish on Sunday in Innsbruck, Austria. In 1984, Canada's Steve Bauer won a bronze medal at the road world championship in Spain, just a few weeks after he captured the country's first Olympic medal in road cycling at Los Angeles. "My ears were ringing because the people were so loud and I could hear their cow bells," said Woods, an Ottawa native. "Even before the race, I told myself I'd try to get inspiration and energy from what the fans bring to the race. There were so many fans today." The 31-year-old led Sunday's race with less than 10 kilometres remaining before bowing to Spain's Alejandro Valverde, who sprinted to his first world title after a grueling race of six hours 46 minutes through the Austrian Alps. 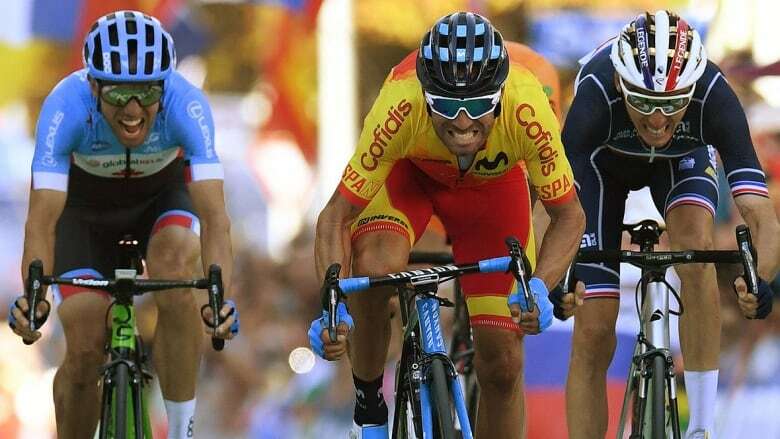 Valverde led a group of four in the final kilometre, including Woods, and just remained ahead in the sprint, with Romain Bardet of France taking the silver. Sunday's victory came 15 years after Valverde won silver in Hamilton, a feat he repeated in 2005 in Madrid. "This is the greatest day of my career. It means everything to me to take this victory," the 38-year-old Valverde said through an interpreter after becoming the first Spanish world champion since Oscar Freire won the title in 2004. Sunday's title came a year after he suffered a fractured kneecap in a fall in the Tour de France, forcing him to end his 2017 season prematurely. Valverde, who served a doping suspension earlier in his career, positioned himself for the win when he went ahead of the pack together with Bardet and Woods for the final five kilometres. He is planning to retire following the 2020 Olympics in Tokyo. Also representing Canada in Sunday's race were Rob Britton (Rally Cycling), reigning national road race champion Antoine Duchesne (Groupama-FDJ) and Hugo Houle (Astana). Woods, who rides for the EF Education First-Drapac, or Cannondale-Drapac, was second in the prestigious Liè​ge-Bastogne-Liè​ge one-day race in April, the first Canadian to reach the podium at the event. In May, he was also runner-up on Stage 4 of the Giro d'Italia and ended up 19th after being slowed by illness. Woods, who makes his home in Spain these days, is a former elite distance runner at the University of Michigan. He switched to cycling after a recurrent stress fracture in his foot and turned heads early in the 2016 season with a fifth-place finish in his first road race as a World Tour pro at the Tour Down Under in Australia.